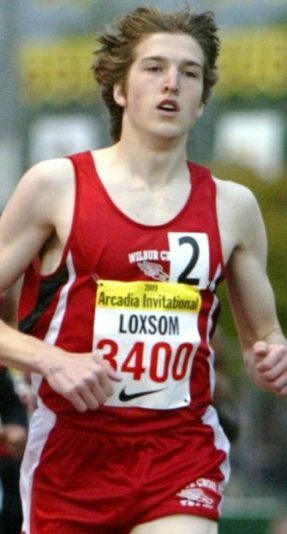 Having run 1:51.88 outdoors last spring, Wilbur Cross CT 800 man Casimir Loxsom came into his senior year as someone definitely well known in Connecticut, but maybe just off the radar for national fans. There were 10 ranked ahead of him on the returnees list, including a few well below 1:50. But what people didn’t know was that Cas was moving off the soccer pitch and focusing on the sport full time – for the first time – as a 12-grader. With a passion for the variety available for middle-distance types indoors, he started racking up the fast times and wins – a 1:21, a few 1:20s, and finally a 1:18.72 at the New Englands for 600, plus a pair of 2:27s at 1000. At Nike Indoor, he was a disappointing 6th, but came right back and won Arcadia outdoors four weeks later with a US#1 1:51.05. He lowered that PR to 1:50.45 winning the Greater Hartford meet. While the national buzz in the 800 still focuses on Elijah Greer and Robby Andrews, Cas is focused and ready for the opportunities that lie ahead and what he wants to accomplish. 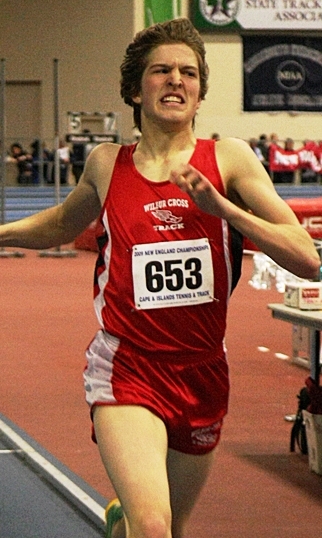 Firmly in his sights is Michael Remingino’s 1987 state record of 1:49.95. He knows he wants to be right there fighting for the win at NON, too, but first – along with the state meets ahead – is his first really competitive 800 race since Arcadia as he faces New Yorker Terrence Livingston at the Danbury Dream Invite this Saturday. DyeStat senior editor SteveU caught up with him for a few questions before the weekend action. 1) Cas, you’ve succeeded so far outdoors in inching your 800 time ever closer to that sub-1:50 goal, as well as winning some big races (Arcadia, Hartford). How would you assess your season so far (since the indoor end at NIN), in terms of training, racing, staying healthy, etc.? Coming off my NIN race, I sat down and had a discussion with my coach about the upcoming outdoor season. We decided that indoors was a success, but it was time to start focusing on the 800. Arcadia was basically run off the end of my indoor peak, and since then I have built my base back up and am looking forward to the post season. I use the dual meets basically as my weekly strength workouts, running four longer events without a lot of rest, and get a good speed workout in too, usually around Thursday or Friday. Basically, so far so good, but it’s a long season. I have a few more races I’d like to win and a few more times to hit before I’ll call my senior track career a success. 2) You’ve got a potentially big race coming up this weekend at Danbury. Given that you’ll face some of the better competition you’ll have before the post-season, how important is it and how does it fit in to your season at this point? The Danbury Dream Invitational is kind of a big deal to us CT folk. Not only do they do a great job of setting up some legit races, but also a lot of people come out to watch. I’m really excited to be in a race where the pace will be fast through the quarter and I can try to really push my limits. I’m really hoping that Terrance (Livingston) shows up ready to run; I’m pretty sick of losing to him and we have a bit of a rivalry going on. If anyone is going to push me to a fast time it will be him. Skinny White Kid vs. Jacked Jamaican, and we both hate losing, so it should be a good race. 3) Beyond that, I’m guessing you have some pretty specific competitive goals and time goals for the rest of the outdoor season. What do those look like? Is there one thing that’s most important for you? I’m pretty set on breaking 1:50. Since I started racing, that barrier has been in the back of my mind. I know that I have the tools to get it done; I just need to do it properly. Every time I race I can feel it, taste it, smell it, whatever. The mental barrier is tougher to break than the physical one. I can say I’m in sub-1:50 shape all I want but I need to do it on the track. I’m confident in my training and I have faith that my coach is guiding me in the right direction. 1:49.95 has been lingering on our state record board since 1987. I think 22 years is long enough. I’d love to be able to shake Mike Remingino’s hand at the end of the season and thank him for giving me a goal to shoot for. Public interview after his Arcadia win. 4) Indoors, you’re able to test yourself at a lot of different distances that seem like a good fit for you – 600, 1000, etc. Outdoors, do you pretty much just stick to 800 and maybe 4x400, or do you try some other stuff, like the 1600, in smaller meets? Do you find you really like the variety of indoor, or do you really like to focus hard on one main event like it seems you do outdoors? Variety is the spice of life; I’ll give indoors the nod. The different distances and relay events that are more common during the winter, especially the middle distance ones, are a lot more appealing to me. Indoors I can run 600, 800 and 1000 all in the same meet; those are all a little more up my alley. Of course, running fast times outdoors is a little more satisfying, but my indoor racing has always been a huge factor in how I perform outdoors. At the outdoor state meets, I just run the 800 and 4x400. This gives me a chance to run a fast 800 fresh and come back at the end of the meet and run fast. I run a few events out of my comfort zone (200, 1600, 3200, 300H) to score points at dual meets, but they fade out by championship time. The start of outdoor signals more specific training for me. I concentrate almost solely on the 800 and splitting as fast as I can on the 4x400. 5) What was your athletic background like before running? What got you into the sport and what led to your focus on the middle distances? I’d like to think that my combination of strength and speed came from 14 years of running up and down the wing on the soccer field. My first indoor season was actually just a conditioning season for spring soccer. I had the mindset that, “A soccer field isn’t half mile long; I don’t ever need to run that far.” Thankfully my coach decided I wasn’t a 200 runner and threw me on the 4x800 my first meet. With the stick in the Greater Hartford SMR. I really liked that track wasn’t a sport where you had to hate the other team and blame the ref every time you lost a game. So I stuck with it while continuing to play soccer. This year has been my first 100 percent running year. I miss soccer a lot and hope to play again someday, but I know that my strength is running and I wanted to focus on that and make the most of it. 6) Outside of Connecticut, people probably don’t know much about Wilbur Cross and the program there. Tell us about your coaches and what your team is like. Is it pretty diverse or particularly strong in some events? Outside of meeting your individual goals, what has been most important to you as a senior in your program? One story from my freshman year basically sums up the makeup of our team and our city. I was leading a four-mile run around one of our city neighborhoods, with the rest of my team close behind. A woman apparently looked out her window as we ran by, and next thing we know, a police cruiser rolls up on us. She had seen a single white kid being followed at a pretty good clip by 10 other black kids and called in a gang violence report. We still laugh about that one quite a bit. We have a very diverse school, with about 30 different nationalities, and the experience has been such a good thing for me. As far as the track program, we have a small talented team. Even though our roster is usually 12 or less deep by the end of the season, we always manage to put up points at the big meets. 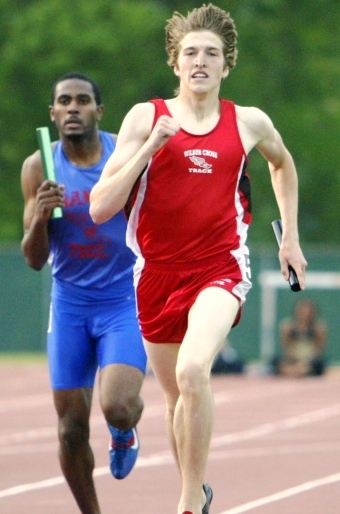 We generally have one or two middle distance guys who pair up with the rest (who usually are sprinters) for some good relay efforts in the 4x400 and SMR. As a senior on the team, it’s been a constant effort to keep everyone motivated and improving. My most important goal for the team is to have fun while putting forward everyone’s best effort. 7) I think when people hear your name, there’s natural curiosity about where you and your family might be from – yet I haven’t seen a lot about that. I’m thinking there might be an interesting story or two there if you would like to share … Was it a big deal as a kid, either good or bad, to have a name like “Casimir,” and did it take you awhile to embrace it? Also, does athleticism and sports participation run in your family? I love my name! 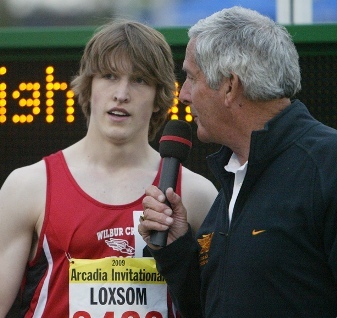 It’s a conversation starter; Casimir Loxsom isn’t a name you hear every day. My mom is 100 percent Lithuanian and my dad is English and Swedish. Casimir is the patron saint of Lithuania and my great grandfather was Kazimirus, which is the Lithuanian translation of the name. I never quite figured out why I ended up with the weird name, the rest of my family is pretty normal. My parents are John and Christine, my twin brother is Adam and my younger sister is Claire. The only negative aspect of my name has been the misspellings. The local newspaper has printed my name half a dozen different ways; a “Z” always slips in there somewhere. Other than that though, I can’t complain. My grandfather on my mom’s side was a swimmer and a runner, and my dad used to high jump in gym class, but other than that I don’t know of any athlete standouts. My family is very musical and full of singers and musicians. 8) You’ve been pretty active on the DyeStat message boards. A lot of top runners over the years have avoided that because it becomes a headache for them, but others enjoy it. Did you get into posting and stuff before you got to this national level? Has it still been cool for you even as you’ve become one of the best in the country? My coaches joke around that I have the whole Internet memorized; they usually just ask me how the local meets have been going and who’s winning what. I love following track around the country. Some people like football, some people like baseball, I like track. It’s pretty cool going to meets and getting to chat it up with some of the other top guys. I’m a track fan when I’m not racing myself. I get to a lot of meets in my spare time and just enjoy keeping tabs on the season. It is kind of weird, though, when I sign on and see my face on the front page somewhere or my name in a headline or something. I used to just come on and see what was going on in the CT boards. I’m not used to it, but it’s pretty cool. 9) Tell us about the factors that made you choose Penn State, and what you get into the most in the classroom. Any thoughts about a major? Everything just kind of fell into the right place at the right time with PSU. I’ll admit I didn’t know a lot about it as first, but my friend Kristen who is a sophomore there made me promise I’d email the coach. I did a little research and talked with Coach Gondak and set up a visit. It’s kind of isolated, but they have a talented group of young half milers and great facilities. Their hydraulically banked track is amazing and they have a good coaching staff. I’m planning on majoring in Kinesiology. I want to have a major that can keep me close to the sport. I would be interested in physical therapy as well as athletic training. 10) When you’re not running, studying or online, what are people likely to find you doing? What are one or two things that few people know about Cas Loxsom that might surprise them? We have a summer cottage out in Old Saybrook, and I spend a lot of time out there, enjoying the beach and taking my boat out for a spin around Long Island Sound. I spend a good deal of time bouncing around the state, so my house would not be a great place to start looking for me. Also, since my team is really more sprint focused, my Sundays usually consist of trying to find someone to get a long run in with from somewhere in Connecticut. My favorite place in the world is Camp Hazen YMCA! I am a camp counselor and will be spending my summer months getting paid to have fun and work with kids. They were nice enough to give me June 18th-20th off for NON, though!